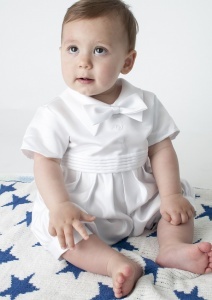 Baby boys white diamond tuxedo style romper outfit tails suit, perfect for your baby boys christening day. Romper Suit: This pure white satin romper is made to look like a suit. It has three mock buttons down the front of the chest with a bow tie resting on the collar. A mock pleated cummerbund is to the waist. Short sleeves with button fastening on the back and also on the legs for easy removal / changing. Jacket: White long sleeved jacket with a diamond pattern and silver sparkly flecks featuring buttons on the front and tails on the rear. 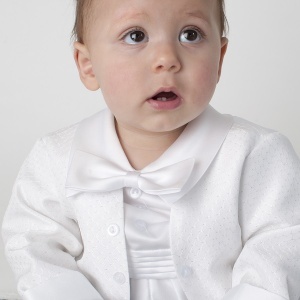 This baby boys white diamond tuxedo style christening outfit made with 100% polyester is of an outstanding quality and will make a precious family heirloom for future generations of your family. My order came very quick and before the expected delivery date. Had to return my order as I ordered the wrong size, returning was not an issue and the new size came very quick. Definitely recommend this company and will be using it again.